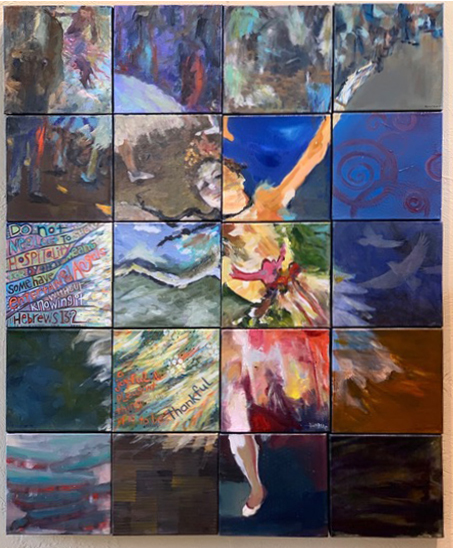 32″ x 40″, Various mediums, collaboration by AAW members. 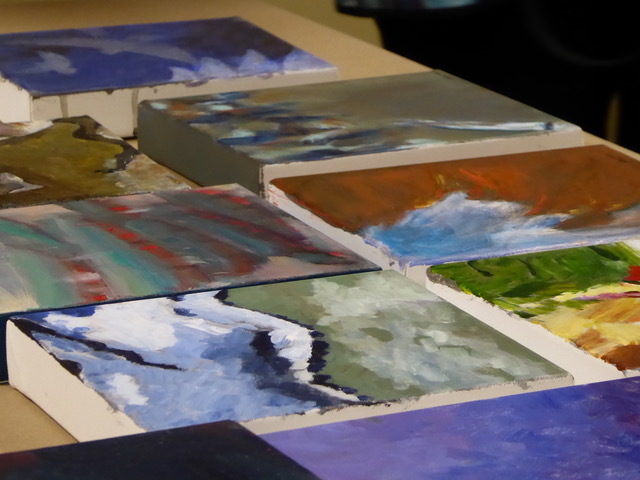 Recently, our members were each given a small 8″ x 8” canvas which had only a quick black and white sketch on it that was part of a larger well-known painting. The artists were instructed to make their own painting, sticking to the values (lights and darks) on the little canvas they were given, and were not were not given any clues as to what the total image would be. 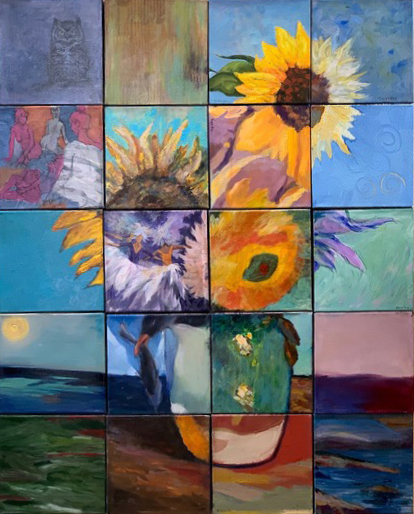 When the group got back together with their completed works, the paintings were assembled into two refreshing unique and updated versions of Vincent Van Gogh’s “Three Sunflowers in a Vase” and Edgar Degas’ “The Star”. The paintings were then presented to Martha’s Kitchen for their upcoming charity auction to raise money to feed the hungry. 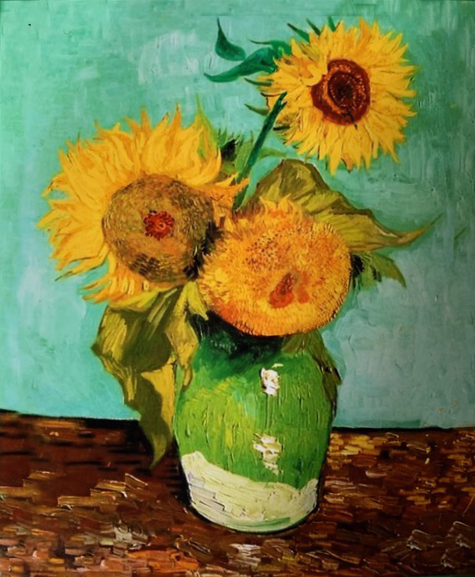 Both of our Van Gogh- and Degas-inspired paintings will be auctioned to benefit Martha’s Kitchen in San Jose, CA during their next Gala event (tbd). Our past collaborative paintings auctioned at this event sold for over $2000! Updated information on the event will be posted here when it becomes available. Participating artists: Michael Rogan, Gary Coleman, Kay Duffy, Kaaren Marquez, Judy Welsh, Karen White, Sandi Okita, Pat Suggs, Julia Watson, Rajani Balaram, Will Maller, Shirley Motmans, Maralyn Miller, Ed Lucey, Mary Ann Henderson, Jen Norton, Taryn Curiel, Veronica Gross, Nancy Takaichi, Sam Pearson and Vincent Liu. 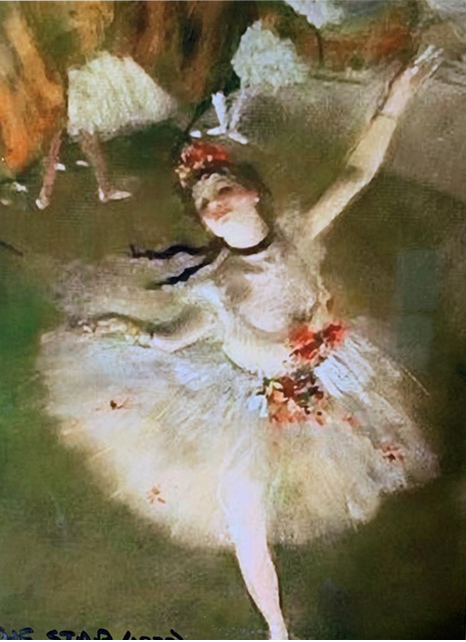 “The Star” by Edgar Degas, 1878 (above, left) and our modern collaborative rendition (above, center).